This chapter discusses my efforts at implementing a queer and feminist pedagogy (Fraser and Lamble 2015) within some BA and MA programmes in Translation Studies in various British universities in which I have taught. Such a pedagogy is informed by a socio-constructivist (Kiraly 2000) and political approach to translation training (Tymoczko 2010; Baker and Maier 2011). Both queer and feminist pedagogies foreground the idea of using students’ and teachers’ own experience about oppression as learning materials, and consider knowledge to be socially and collaboratively constructed—similar to what is taught in political approaches to translation training. 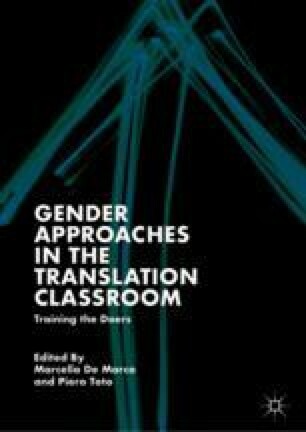 This chapter analyses classroom activities aimed at integrating a feminist and queer pedagogy in translation training, within the context of the constraints and (im)possibilities provided by the British Neoliberal University. Such pedagogical praxis is informed by the idea of queer desire, understood as a pleasurable and disruptive force capable of igniting the potentialities that students and teachers bring to class. ‘Academic Irregularities’. Blog by Liz Morrish. Available at https://academicirregularities.wordpress.com. Accessed 20 November 2018. Morrish, L. 2018. Can Critical University Studies Survive the Toxic University? https://academicirregularities.wordpress.com/2018/06/08/can-critical-university-studies-survive-the-toxic-university/. Accessed 13 June 2018.